Stay for: Tim Robbins' hair. Even if this wasn't one of the greatest baseball movies ever made, it should be preserved in a museum just as an almost platonically pure document of the 80s. Look at that poster with Sarandon's off-the-shoulder blouse, and Costner's baggy pleated chinos and bomber jacket. Marvel at the soundtrack with all its sultry saxophone interludes. 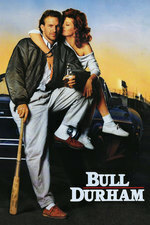 I presume it wasn't intentional on phunniemee's part, but I find it fascinating that three of these Great Baseball Movies have good roles for older women (well, "Hollywood-old") -- Sarandon was 42 when this came out; Rene Russo was 35 when Major League (her film debut) came out (and Margaret Whitton was 39), and Geena Davis was 36 when A League of Their Own came out. I'm posting baseball movies in order of my favorite baseball movies. These are my top 5. I'd like to think, even if it was only subconscious, that I'd be naturally inclined to pick movies that aren't completely horrible to women. I'd like to think, even if it was only subconscious, that I'd be naturally inclined to pick movies that aren't completely horrible to women. And it goes on! In Field of Dreams, Amy Madigan is Kevin Costner's wife, and she's five years older than him. And of course, the whole point of The Bad News Bears was that Tatum O'Neal could play just as hard as the boys. This is weird. Why is it that baseball movies are so much better about this than everything else? * -- So to speak. ** -- At least, no one in Hollywood. Both Kim Basinger and Ellen Barkin passed on the role of Annie Savoy, and nearly every leading man in Hollywood was offered Crash Davis, and Charlie Sheen was first choice for Nuke. "Candlesticks always make a nice gift. Or find out where they’re registered and perhaps a nice place setting." This is one of the most quotable movies I've ever seen (and I've seen it quite a few times). "Another new league record" and "It's a miracle" is still in our family lexicon and just about every time I look at the sports section, I'm reminded of Crash's advice on interviews.